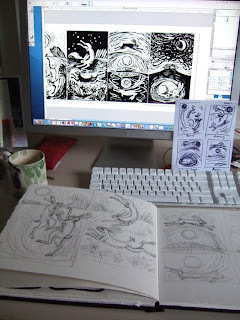 acornmoon: A "cuppa" interview with illustrator Celia Hart. 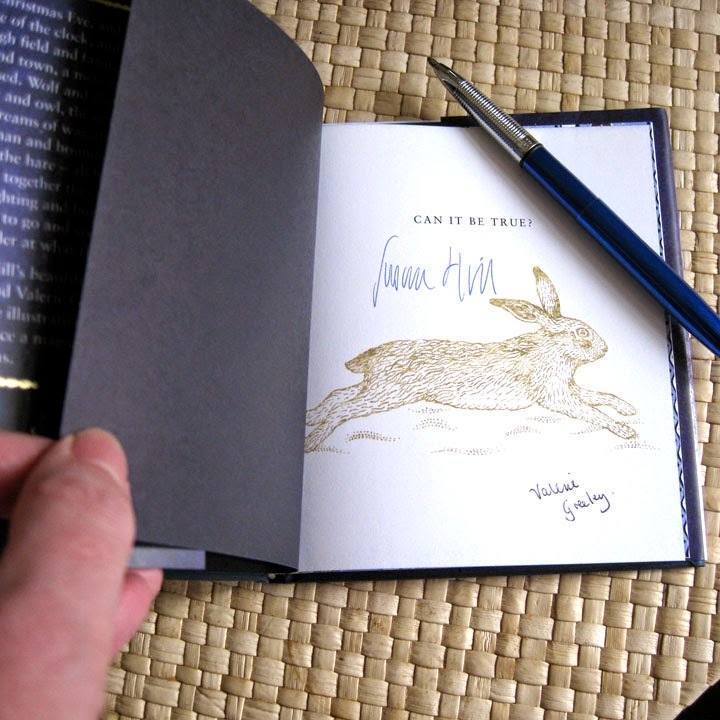 A "cuppa" interview with illustrator Celia Hart. My blog will be one year old this week and I have been reflecting on how it felt to post my first entry, it was a bit like talking to the ether! I cannot tell you how exciting it was to get my first comment but then again you will no doubt have had the same feeling yourself. I wanted to create a place where I could share inspiration, a meeting place of like minds and also I wanted an inexpensive and easy way to link to my website information about work and products etc. Working from my studio, a.k.a. my dining room can be lonely at times and apart from dog walkers and neighbours, opportunities to meet new people are few and far between. 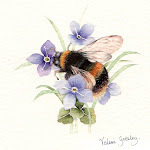 Since I have started my blog however, I have found a whole new world of artists, gardeners, writers, dog walkers, designers, quilters, bookbinders and all round lovely people who have enriched my life and brought great joy and that all important ingredient to the life of any creative individual, that is inspiration; so for that ladies and gentlemen I thank you and invite you all to share a “cuppa” with my special guest artist Celia Hart, otherwise known as Magic Cochin from her blog Purple Podded Peas. 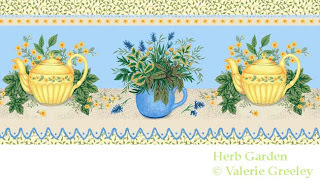 When I first saw Celia’s blog I felt so inspired that I went out and bought myself some lino! This will be my third such interview to date so whatever your nationality, wherever in the world you have traveled from, pull up a chair and pour yourself a nice cup of tea on this Saint George’s Day. Q1) How do you take your tea and in what kind of cup do you like it served? Today I’m drinking Clipper Organic Everyday Tea with semi-skimmed milk, no sugar; in an Emma Bridgewater Birds mug – this one has Fieldfares on it. Q2) If you could choose anyone, past, present or future, who would be joining us for tea. 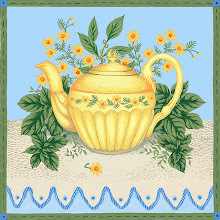 I’d like to invite William Morris and David Hockney to join us to tea. 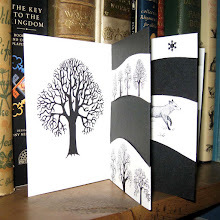 Morris was one of the first designers I really got enthusiastic about, I think we could chat to him about gardens and wildflowers; textiles and furniture; poetry and illustration; typefaces and book binding. Hockney could tell us about how he uses a computer to help him work on his paintings and about the optical instruments used by artists in the past. I think they’d both be partial to a cup of tea and a toasted tea cake – don’t you? Q3) Tell me a little about your background in art and design. I went to Brighton College of Art & Design, my degree course was called ‘Visual Communication’ – which covered typography, graphic design, illustration, photography, advertising, etc. It was just before the advent of Desk Top Publishing so everything I’ve learnt about digital illustration and DTP has been hands on, for ‘real’ publishing projects. 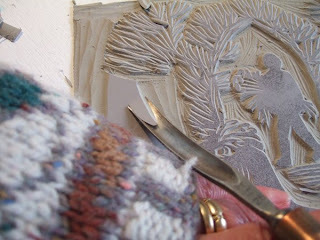 Today I use my computer as just another tool to achieve an end result – for instance my prints start as a sketch, the designs are worked up digitally, then they become hand-carved blocks before I print each colour by hand. Q4) Where are you based and does it influence your work? I work in an office and studio which is attached to our house. The building was once a Victorian billiard hall and it is within a walled garden. 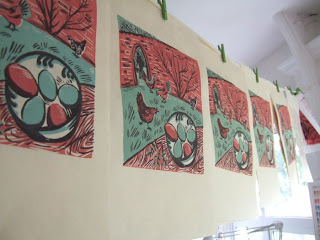 My latest set of prints are inspired by working in the garden this spring and include our six hens. I tend to think about a possible print for a long time before actually starting work – this is an indulgence, as by contrast commissioned work is usually done to a very tight deadline with no ‘thinking time’ allowed. 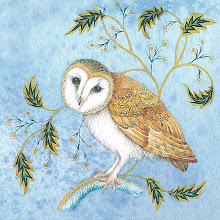 I love going for long walks and the things I see as I walk inspire ideas for new prints: hares and deer running over the fields; the textures of trees and field furrows; a flock of birds landing in a hedge. Q5) What have you been doing/working on today? Today I have been completing some digital illustrations for a GCSE Spanish student’s book for a major UK publisher (sounds boring – but I enjoyed working on these ‘vector’ illustrations). 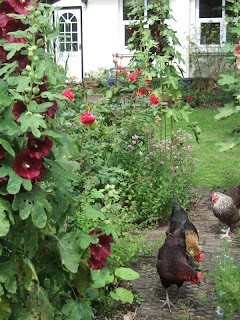 Later I will finalise the pages of the May edition of the village magazine – I’ll also need to take a photo for the cover, which will mean going for a walk to search out a good ‘May’ scene. Sadly, there’s no time for printmaking today, but there are prints hanging up in the studio ready to be numbered and signed. And I need to get the framed prints ready for an exhibition in Norwich. I should think I’ll fit in some gardening too, I usually do. Q6) I hope that you have brought along something wonderful to show us, what is it? 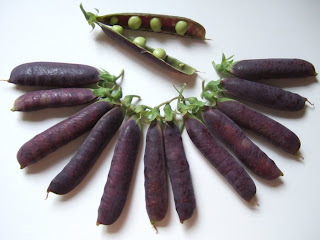 (Let’s pretend it’s July) I’ve brought some Purple Podded Peas from my vegetable garden – one of the ten varieties of pea I’m growing this year. 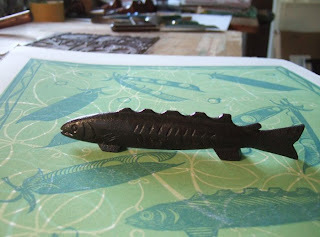 I’ve also brought along a cast iron fish which sits on my drawing board, I bought it in Japan. It’s both a brush rest and paper weight. I think the pea-pods and the fish are both beautiful and useful so Mr Morris would approve! And both sometimes appear in my prints too. 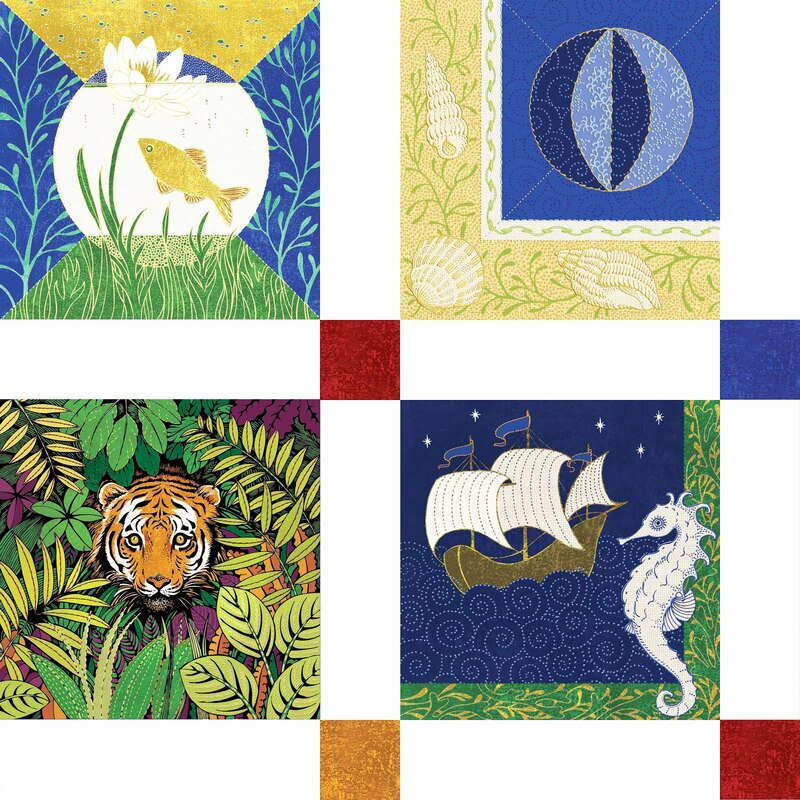 Well thanks so much for being my guest Celia, I know we have lots in common, we share a love of William Morris and David Hockney, of Japanese prints and country gardens. I am very envious of your walled garden, that is my idea of the perfect garden and something I have tried to create here. I am sure your work will continue to inspire and delight fans old and new. England's green and pleasant land.